A writer of fantasy and literary fiction, Adrienne’s short stories have appeared in a number of publications including, The Storyteller, New Plains Review, and in the e-zines A Fly in Amber, The Devilfish Review, and Rose Red Review. Her short story, Falling was awarded second place in the 2008 Alice Munro short fiction contest. 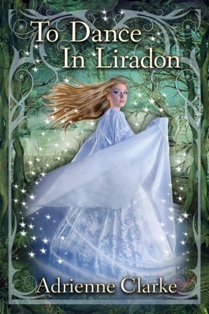 To Dance in Liradon is her first published novel. Adrienne is represented by Joanna MacKenzie at Browne & Miller Literary Associates. An avid reader of fairy tales and other magical stories, a thread of the mysterious or unexpected runs through all of her work. Thank you for joining me today, Adrienne. Thank you for having me Melissa. Q: Could you describe for me the moment that launched you on your journey of becoming a writer? A: For me, there was no single defining moment. I’ve always known I wanted to be a writer. I started writing short stories as soon as I could string sentences together, and have been struggling to improve my craft ever since. Q: How has your ‘day job’ or post-secondary schooling influenced your writing? What would you consider to be the main influencers to your writing? A: I chose to be an English major because I wanted to be immersed in books. I firmly believe the best way to make yourself happy is to devote a large part of your time to the things you love. So many people tell me they don’t have time to read, but I find that hard to understand. Reading and writing are like breathing to me so no matter what else is going on I always make time for both. It might be challenging at times, but if you want to find the time to write (or read) you will. Q: How instrumental was your support group (family, friends, colleagues) in making this book a reality? Q: What were the most challenging aspects of bringing your book to life? A: For me, writing is the easy (and fun) part. It’s what comes after the last word is written that’s hard – all of the querying, self-promotion, and social networking that you need to do to make people aware that you have a book out there. A: First and foremost, I hope readers feel transported to the dueling Faerie and human worlds I’ve created. I think the best books take you on a journey, introduce you to characters you grow to love, and leave you heartbroken when you turn the final page of the story. To Dance in Liradon is about true love, growing up and finding your destiny, and I hope readers feel that I’ve explored these themes in a meaningful way. Q: Who is your favourite character in your novel? Describe an interesting moment in the development of this character. A: My novel’s heroine, Brigid, is my favourite character because she’s brave and strong and is prepared to risk everything for true love. I’m always attracted to stories where the girl rescues the boy, and I’m proud to say that To Dance in Liradon is one of them. A: One of the most important things you must learn as a writer is how to “show versus tell.” Making the reader feel as though they are in the moment and experiencing the emotional life of scene right there with the characters is incredibly difficult and incredibly satisfying when you get it right. There is a pivotal scene towards the end of the novel that I hope really engages all the readers’ senses. Ideally, you want the reader to feel as though they’ve crossed the veil into the fantasy world you’ve created. A: I think any path to publication has its challenges, and whatever path you choose you need to do your research so you know what you’re getting into. Traditional publication has always been my dream, but for most of us it’s a long and challenging road. When I first started writing I thought talent meant everything, but now I think the most important quality for a writer to have is perseverance. Some of the most talented people I know have given up, while less talented people have found success simply because they refused to give up. Bottom line: writing is hard work! A: The most challenging aspect is the pressure to invest so much time in social media. As much as I enjoy connecting with fellow readers and writers, I’m not the kind of person who enjoys tweeting and posting twenty-four seven. Time is precious, and I’d rather leave stories behind than a bunch of disposable tweets. That being said, I think the new face of publishing demands that authors seek new ways to engage their audience. However, despite the voluminous body of information for writers on how to do this, marketing success remains a very illusive thing. A: A lot of writers have inspired me in different ways, but the three that come immediately to mind are Neil Gaiman, whose power of imagination is incredible to me, Alice Munro for her beautiful prose that somehow transforms the ordinary into something extraordinary, and Stephen King for his passion for story in all its forms. Although my writing is nothing like Stephen King’s, I’m continually amazed by his dialogue that never has a false note. Reading Stephen King is like taking a master class on how to write good dialogue. Q: If you could choose any fictional character, which one do you most identify with? A: Keturah from Martine Leavitt’s book Lady Keturah and Lord Death. On the surface, Keturah and I have little in common, she’s a peasant girl living in the Middle Ages, and I’m a middle class woman with two children, however, I powerfully relate to her need to tell stories, particularly stories about true love. Keturah is fascinated with true love and I guess I am too; it’s the theme I always come back to. I think I feel compelled to write young adult novels because I still very close to the girl I used to be – someone who doesn’t expect miracles but hopes for them anyway. I loved Keturah’s character so much I named by daughter after her, Juliet Keturah Clarke. Thank you very much for taking time out of your busy schedule to speak with me. I wish you all the success with this and future novels. It’s been my pleasure, Melissa. Thank you for the warm wishes.